What They Say.....When Emma Montague left the strict confines of upper-crust British life for New York, she felt sure it would make her happy. Away from her parents and expectations, she felt liberated, throwing herself into Manhattan life replete with a high-paying job, a gorgeous apartment, and a string of successful boyfriends. But the cutthroat world of finance and relentless pursuit of more began to take its toll. This wasn’t the life she wanted either. 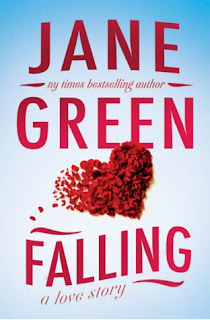 What I Say.....It's no secret that I'm a huge Jane Green fan. It's no secret that I love easy to read chick lit, especially when true love just falls into your lap, without any pesky first dates. Emma has plenty of money, is taking a sabbatical from work/life. So she decides she wants to move to Westport, Connecticut and rent a beach house. She finds the perfect rental, a house on the beach, but knows that she will have to do some major redecorating since it is still celebrating the 70's. But that's okay, because Emma loves to decorate, and is actually hoping to make this her new career. Luckily, Emma has a very accommodating landlord, Dominic. Dom lives next door, and makes himself available to build (crooked) bookshelves, do the heavy lifting and just generally be the perfect man. The relationship blooms very quickly into every night sleepovers and talking about forever. But Dominic has a young son, who isn't sure that he wants Emma to join their tight little family. Like most little kids, he either loves Emma or wants her to leave and never come back. There doesn't seem to be a lot of in between, and Emma spends a lot of time worrying about how she can integrate into their lives - trying to balance acquiescing to his asks (eating pancakes instead of her preferred fruit), while worrying about whether she's trying to buy his love (buying a trampoline). Honestly, it's not that different that what you go through with your biological kids. Little kids are painful - I thank God every day that mine are all grown now. When Jesse's mom comes back into town, I thought that would be the big twist, but it was really a minor bump in the road - I would have liked to see that explored a little more, but later there is a much bigger twist that falls into your lap. I don't want to give any spoilers but this book reminded me of why I stay single!!! Pain is always lurking around the corner, waiting to sucker punch you. This book was really Emma's journey of deciding who she really was vs. who the world (and her mother) wanted her to be. She feels like she is ultimately a sophisticate, who should go to the theater and museums, but she falls head over heels for a bartender/part time carpenter who has no aspirations to leave his hometown behind or go to the theater. Emma ultimately has to decide who she really is and where she wants her life to wind up.